UPDATE: Honor has confirmed that the Honor 8 does not support T-Mobile’s Wi-Fi Calling. Huawei’s Honor brand is fairly new to the U.S., but they’re expanding their presence this month with the launch of the Honor 8. 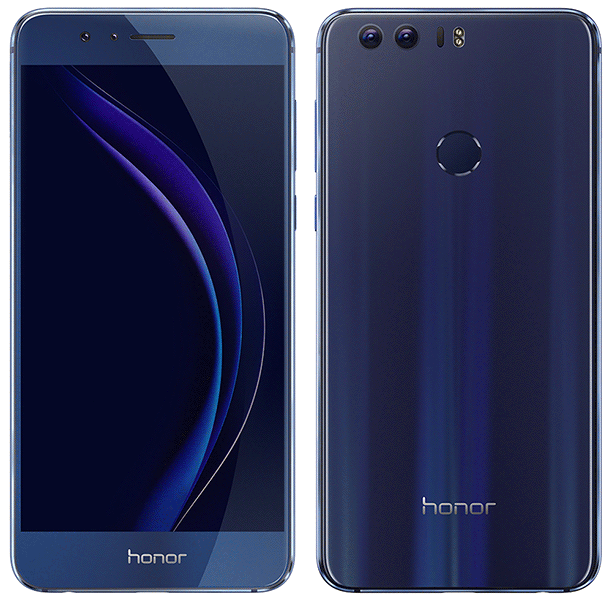 The Honor 8 will be available for pre-order starting tomorrow, August 17, through September 3. It’ll be available from Honor’s own web store as well as Amazon, Best Buy, B&H Photo Video, and Newegg. When it comes to color options, you’ll have your choice of white, black, and blue, with the blue being exclusive to Best Buy for the first 60 days of availability. Pricing will start at $399 for the 32GB model and go up to $449 for the more capacious 64GB flavor, but both models will come with a $50 gift card. When it comes to features, one of the Honor 8’s highlights is its dual rear camera setup. There are two 12-megapixel cameras on the Honor 8’s backside, one of which is a color lens while the other is black and white. Honor says that this lets the Honor 8 capture more light when you’re snapping photos. 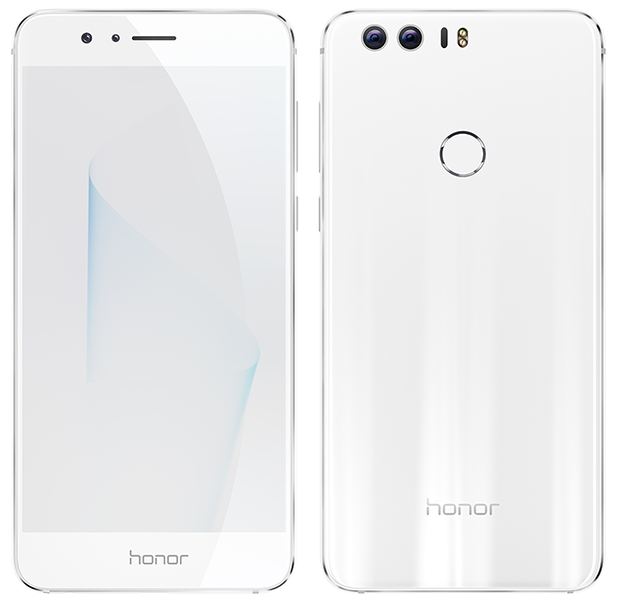 The Honor 8 features glass on both sides of its shell, a 5.2-inch 1920×1080 display on the front, and a fingerprint reader on its back. Inside of that shell is an octa-core Kirin 950 processor, 4GB of RAM, 32/64GB of storage, a microSD slot, NFC, and an infrared remote control. A 3,000mAh battery powers the whole package, and when it comes time to recharge the Honor 8, you’ll do so with its USB Type-C port. On the software side, the Honor 8 runs Android 6.0 with Honor’s EMUI 4.1 user interface. Honor has baked some special features into its device. The Smart Key on the back of the phone can be clicked to capture a screenshot, double-clicked to activate the flashlight, or long-pressed to launch an app of your choosing. The Honor 8 includes GSM 850/900/1800/1900 and WCDMA bands 1/2/4/5/8. LTE support includes bands 1/2/3/4/5/7/8/12/17/20. Honor says that the Honor 8 also includes support for VoLTE on T-Mobile. I’ve asked if Wi-Fi Calling is in there, too, but haven’t yet gotten an answer. The affordable flagship category of smartphones has grown quite a bit over the past year or two, and the Honor 8 is the latest addition. 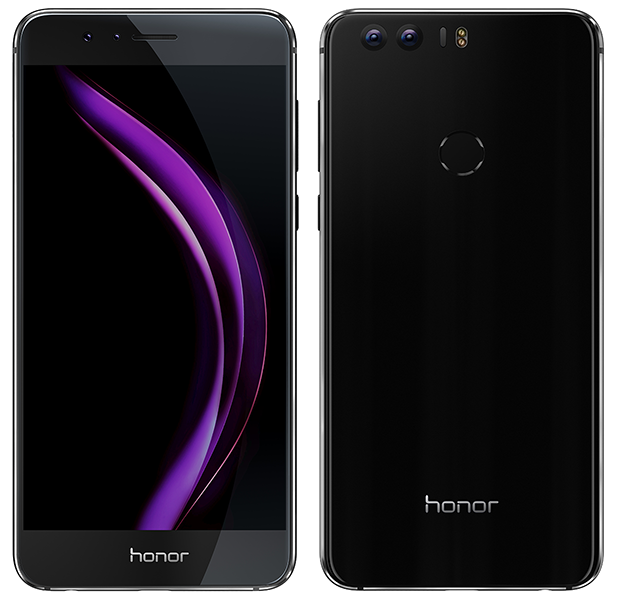 It’s got many of the high-end specs that you’d find in other Android flagships, like 4GB of RAM and a a microSD slot, but Honor is trying to steal attention away from other devices with the Honor 8’s $399.99 starting price. Its basically an Alcatel idol 4 with dual cameras. I really don’t like that it’s pushing the $400 mark for what it is. There isnt anything midrange about the kirin 950. The soc used on this phone is the same chip used in the Huawei Mate 8 from earlier this year. I’m speaking from experience when I say that chip performs fantastically. Hopefully the rise of these Chinese flagships will help drive down the cost of phones. I agree, phones are overpriced and I feel like Samsung just does same updates to their phones and sell them as all new. That’s why they can afford the BOGOs and they can offer “freebies”. I’ve had tmo for over 10 years and I have never used wifi calling. Here the same, and I never use Wi-Fi either. But I understand that many people need Wi-Fi Calling. What we need to know is if it has VoLTE and CA. In my case, I’m not buying a Chinese phone brand though. Why is VoLTE so important. I get VoLTE calls everywhere but I have never noticed a difference once. It was kind of hyped. In T-Mobile’s case, VoLTE means coverage, especially as the 700Mhz A-Block spectrum is concerned. Also, as wireless carriers begin to transition their spectrum from older 2G and 3G technologies, VoLTE will become even more important for any voice call period. It’s basically voice over LTE. My current phone (unlocked, no VoLTE) jumps to HSPA for calls. The difference in call quality is immediately noticeable. Lets say you’re in an area where only LTE B12 is available, without VoLTE you’ll not be able to make calls only use data. That’s why T-Mobile was asking manufactures to disable B12 in phones that don’t have VoLTE, so people don’t get into a situation where they see they have coverage but are unable to make calls, specially 911 calls. WiFi calling is a must for us. The T-Mo coverage where we are is not really great yet. It has improved a little, but WiFi calling allows us to use our phones where we are. Like most unlocked phones, the answer is probably no. Heard back from Honor this morning. The Honor 8 does not support T-Mo’s Wi-Fi Calling. Seems like a very tempting offering. If I was in the market for an affordable flagship, I would definitely consider this phone. With all the great options in the sub-$500 range, I really don’t see a reason to spend hundreds more for a similarly-spec’d device. At this price I would expect at least a quad HD screen, 1080p is acceptable but not when compared to similarly prices phones. This phone is also smaller than the other $400 phones. I don’t think theres been a smaller low cost phone with QHD yet. I know the Axon 7 and Alcatel Idol 4S have QHD both have 5.5 inch screens. Maybe it’s a supply price issue for smaller screens. The phone reminds me of a Nexus 5X, but prettier. I am not familiar with a Kirin 950 chip. Is that chip and GPU a good performer? Is the Kirin 950 chip supported for many apps within the Android ecosystem? That’s about right. As such, $400 is too much for this device. Yeah the OnePlus 3 & ZTE Axon 7 are the two best $400 phone options; right now anyway. Kirin 950? Pass. Go get a OnePlus 3.
what about Honor Note 8? Too bad about no WiFi calling support. If a lowly LG Leon can do WiFi calling, no excuse for a “near flagship” phone not to. LG Leon is T-Mobile branded, therefore support for WiFi calling is built-in. The Honor 8 is not.